If you decided to buy a blood glucose meter for measuring blood sugar level by yourself, or for your relatives or friends, we advise you to have a look at SD CodeFree blood glucose monitor system without coding produced by the South Korean company SD Biosensor. TODAY, WE OFFER YOU THE LOWEST WHOLESALE PRICES ON THE MARKET! DOCTOR SAID THAT YOU URGENTLY NEED A GLUCOMETER? A person is given the unfortunate diagnosis of diabetes. Endocrinologist explained that now the person will need to go for prescription drugs, and stand in a queue once a week to measure sugar level in his blood. However, long queues can be avoided if you buy a portable blood glucose meter. Surprisingly, the endocrinologist in the hospital kindly recommends what device one should buy and even mentioned where to do it better. SD Check Gold is the simplest to use, while the latter two have an expanded set of options. 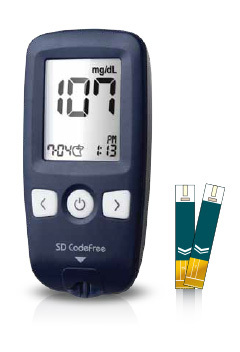 However, the most common and optimal in the price-quality ratio is SD CodeFree blood glucose meter. SD CodeFree blood glucose meter compact size and high speed of measurements are very important factors for young people. All these devices carry out measurement of blood sugar level in just five seconds. The SD CodeFree blood glucose meter test strips require the smallest drop of blood, and the most compact containers for test strips! The meter has a handy feature — Meal Mark. When you enable this function in the meter menu, a measurement result of the blood sugar level can be marked as “Before meal” and “After meals”. The device records and displays averages for 7, 14 and 30 days. It is very convenient for those who want to manage their diet and understand how and in what quantities particular food that you can eat affects the level of sugar in blood. SD diabetes management software helps you collect self-testing data, analyze it with easy to read comprehensive graphs and act on the results to continually improve your diabetes management. This program has an easy to master interface, intuitive and easy-to-read data tables, smart reports with colorful graphs. You will have to request a SD Software Communication cable when you order your kit. The software can be downloaded from this link to the SD Biosensor website. It supports English, Spanish, Italian and Chinese languages. 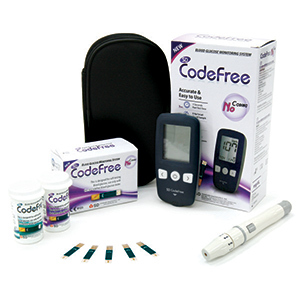 The SD CodeFree from SD Biosensor has become popular recently because the test strips are quite cheap. It has become quite popular with those who need to buy their own strips. To receive the most recent information on pricing and minimum order quantity, please contact us directy over the e-mail: [email protected] or by phone in South Korea: +82-10-3328-5799 (during regular business hours).